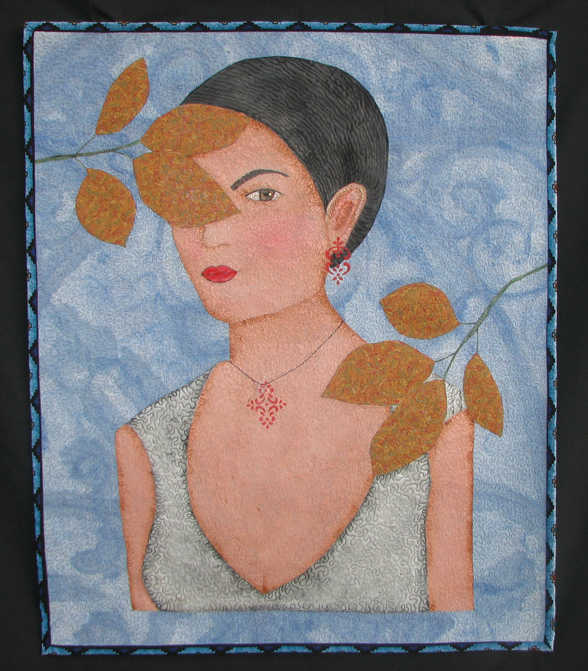 My infatuation with art started with hand embroidery, I was about 13 when I picked up a needle and thread for the first time. I have continued on for the last 35 years with various art projects. The first piece that I hand embroidered was for my mother and was a nursery rhyme entitled “Sunday’s child” which I still have. I moved on to embroider old pairs of denim jeans, shirts, and anything I could use to express my creativity. My father was an artist and painted with oils, and I soon discovered the art of painting. I discovered wood, and began with tole painting projects. In addition I began making dolls; my mother would make and repair dolls for the local church and I quickly picked up the skill. About 10 years ago, I eventually found my own art form in art quilts which is where I continue to now express my creativity. I design my own patterns, dye my own fabrics and machine and hand quilt my own work. I love the fact that I can use my own ideas and create so many different variations of my work utilizing fabric, thread, paints, sewing and quilting to end up with unique pieces of art. I have been graciously rewarded for my work with numerous awards in competitive events at local venues. Hi Teresa! I love how you are developing your blog. Your statements are getting really good! I finally took the plunge and have an account as a “follower” for various blogs – but I don’t find that set up on yours – so I’m thinking that you use this neat “Leave a Reply” method of comments and post following. It’s easy.